You could assume from the character models that all of the Horde players in World of Warcraft are villains and thieves, but you'd be dead wrong. The Horde were aesthetically unrelatable. Alternately Creature Features and C.O.W.-Boys of Moo Mesa, they simply weren't fun to look at - so they became the enemy. Tepid low-level forays into the Barrens begot Tarren Mill turf wars begot hitting the level cap and spending hours on end staring at my lifeless corpse as it was defiled by another Horde player character, spamming the /spit macro or, classier still, sitting on my face. I'm not Horde. Neither are my friends, for that matter. So who are Horde? Were they the vile, basement-dwelling mouth-breathers I'd accused them of being during my numerous, expletive laden mental rants? Did playing as such unsightly characters have an averse effect on the player base? What kind of person could relate to a character with open wounds? Speaking to roleplayers, raiders and even PvPers on the Horde side gives Glover insight on why players pick the Horde. What he finds out may surprise you. 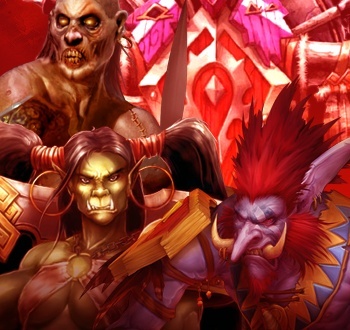 Read the rest of For The Horde! to find out.